And I know these streets and I thought I knew you, but I got lost when I found the new you. 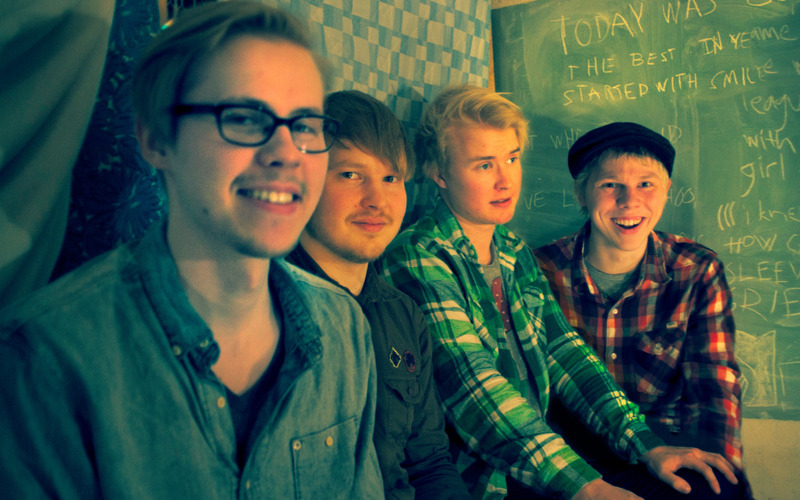 Satellite Stories is a four-piece indie rock band from Oulu, Finland. The band consists of Esa on vocals and guitar, Jyri on bass, Marko on guitar, and Olli-Pekka on drums. While their northern and snowy hometown in Finland is known for a large number of heavy metal bands, Satellite Stories draw influence from upbeat indie rock/pop bands like Two Door Cinema Club, Phoenix, and The Wombats. Esa and Olli first met each other during a university lecture, where they bonded over their shared music tastes. Although they are currently unsigned, they have already seen some success with the release of their 2011 self-titled EP. Satellite Stories earned a Top Ten spot on both The Hype Machine and We Are Hunted, and had a song featured in an episode of MTV's “Jersey Shore.” They're currently touring around Europe and recording more material. As cliché as it may sound, the grass is always greener on the other side. For Satellite Stories, a four-piece indie rock band from Oulu, Finland, the “other side” is in Mexico. On their 2011 self-titled debut EP, the song “Mexico” is their musical attempt to escape the subarctic climate of their hometown. A booming, galloping drum beat creates a frantic “let's get out of here NOW!” sentiment. And considering Oulu's average annual temperature is just above freezing, it's no wonder they've taken to chanting “let's go, let's go to Mexico!” It's almost like they're channeling Dorothy in “The Wizard of Oz,” who repeats the phrase “there's no place like home” until she's actually back in Kansas. Considering Satellite Stories is from Finland, the country that spawned heavy metal bands like Impaled Nazarene and Satanic Warmaster, it may come as a surprise that they make music that could very well be seen as metal's mortal enemy. For whatever reason, this Nordic country is a hotbed (albeit a very cold one) of highly amplified, guitar-shredding music (the annual Air Guitar World Championship even started here). Instead of making headbanging/mosh pit-inducing music, Satellite Stories are more influenced by the energetic and happy sounds of bands like Two Door Cinema Club, Phoenix, and The Wombats. Songs like “Kids Aren't Safe in the Metro” are much more likely to put a smile rather than a snarl on your face. It's immediately catchy, with a memorable chorus that references popular British supermarket, Tesco. The lyrics are simple, but this is the type of song that's more about evoking the urge to dance rather than making you ponder the meaning of life. Similarly, “Blame the Fireworks” is simple, but with an utterly feel-good vibe. A single guitar riff gets the song going, before it takes off into a head-boppin' beat. By the time it reaches the chorus, it's easy to envision jumping up and down to this song in a packed and sweaty club that serves as a shelter from the frigid Finnish air. Although they haven't released a full-length album yet, keep Satellite Stories on your radar.